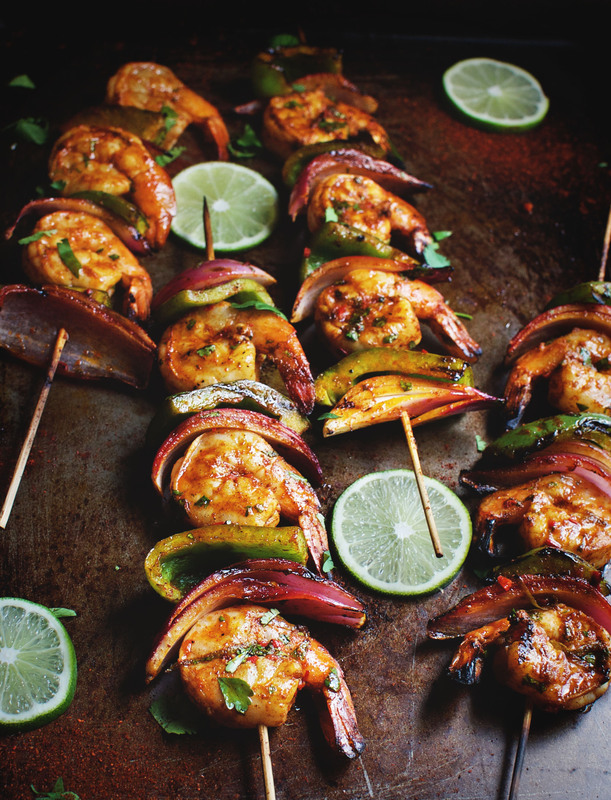 These spicy Grilled Chili Lime Shrimp Kabobs make a great main course for a summer barbecue. They are suitable for low-carb, ketogenic, Atkins, gluten-free, Paleo, and Banting diets. It’s time to fire up the grill! 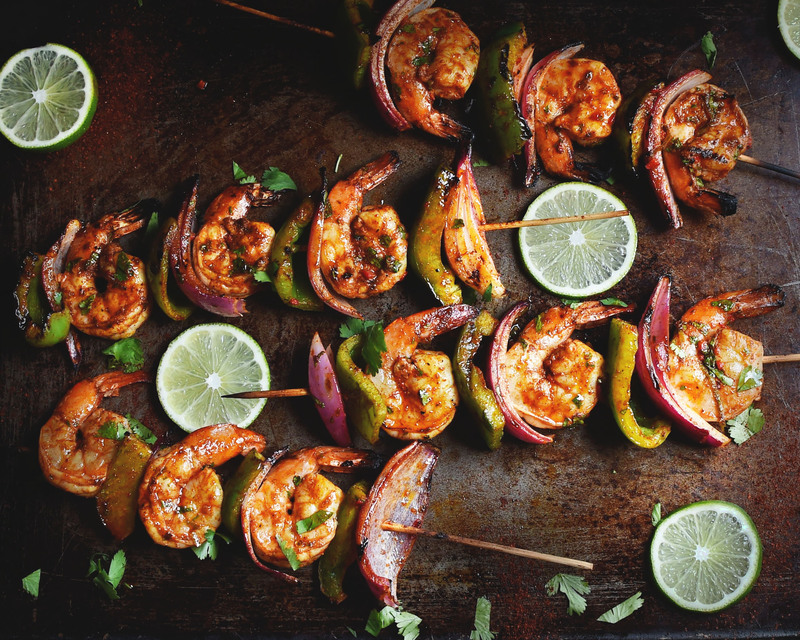 If you haven’t started grilling yet this year, may I suggest that you christen your grill with these Grilled Chili Lime Shrimp Kabobs. 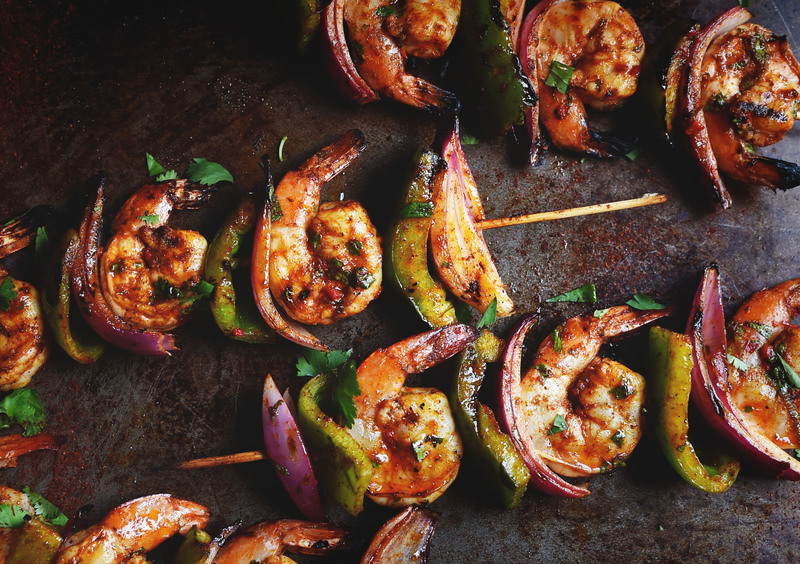 These kabobs have shrimp marinated in lime juice and olive oil spiced up with jalapeño pepper and chili powder. The marinade contains nuances of garlic, cumin and cilantro and just a bit of low-carb sweetener to balance the acidity. 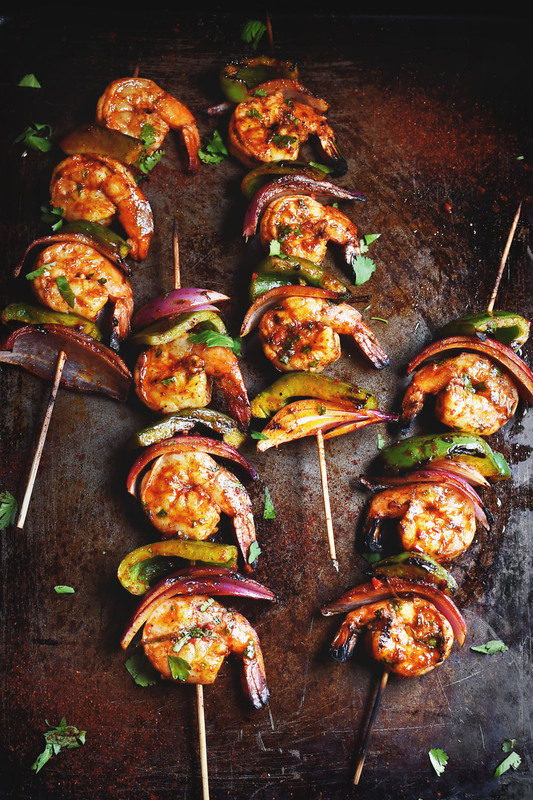 These marinated shrimp are then skewered with some red onion and bell pepper. The vegetables are brushed with marinade to add some flavor before the kabobs are placed on a hot grill. When the shrimp has finished cooking, these grilled vegetables are crisp-tender–just the way I like them! because stevia is a natural ingredient, and erythritol, while it may sound scary, is really a sugar alcohol that naturally occurs in the body. Some sugar alcohols can cause digestive upset, but erythritol usually does not. Neither stevia or erythritol are associated with some of the more scary side effects that artificial sweeteners are. If you decide to leave the sweetener out, the flavor of the marinade will be a bit brighter and more acidic. This recipe is super easy to make. It takes about 10 minutes to make the marinade and 10 minutes to actually grill the kabobs. However, be sure to to allow time for the shrimp to marinate. About 45 minutes to an hour allows them adequate time to soak up the spicy lime goodness. If you’re using bamboo skewers, you’ll need to soak them before using. I start soaking them in warm water before I prepare the marinade. This gives them about an hour of soaking time and is sufficient to keep them from burning into ashes on the grill. 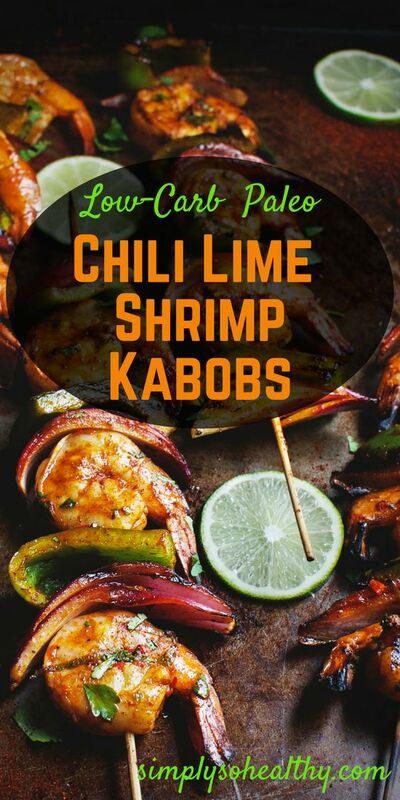 This Grilled Chili Lime Shrimp Kabobs recipe is a great way to kick off grilling season! Serve these kabobs with a salad to make an easy and delicious meal. Enjoy! Prepare bamboo skewers by soaking in warm water for 45 minutes to an hour. If you do this first, they should be adequately soaked by the time the shrimp are finished marinating. In a medium mixing bowl, stir together the lime juice, olive oil, lime zest, jalapeño garlic, chili powder, cumin, granulated sweetener (or honey), cilantro and salt. Stir together until mixed. Stir shrimp into the marinade. Cover and refrigerate for 45 minutes to 1 hour. Preheat grill to high. Slide the shrimp, bell pepper, and onion chunks alternating. Brush the kababs with the remaining marinade being careful to cover the vegetables. Place kabobs on grill over high heat and cook over an open grill for 3-5 minutes. Using tongs, turn skewers and grill for another 3-5 minutes or until shrimp are opaque and cooked through. Remove from grill to a serving platter. Serving size: 1/4 of recipe or about 5 ounces. Thanks Bethany! I love hot and spicy! Tried these last night. Delish! Hubby already telling me to buy more shrimp. Yay! 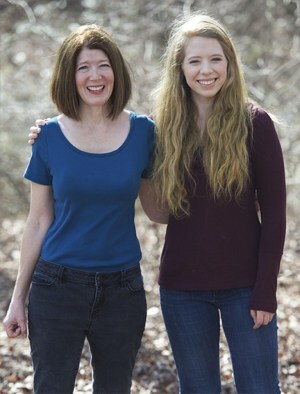 I’m so glad they were a hit with both of you! Just tried this a few minutes ago, OMG DELICIOUS!!! I grill a lot. This is one of my favorite recipes now. Followed recipe and it was perfect. I used stevia. I want to try this with beef! Thanks so much! 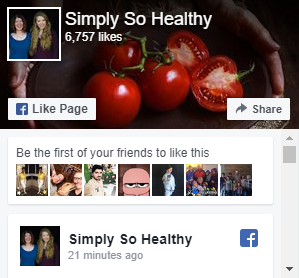 This recipe would be fine with beef or chicken!